Ricoh will formally launch the six new monochrome A3 multifunctions shortly. The Ricoh MP 2554, MP 3054, MP 3554, MP 4054, MP 5054 and MP 6054 run at speeds of 25 to 60 ppm respectively. 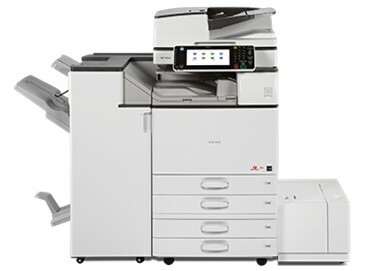 These new products benefit from some of the improvements already made to the color range, such as the 220-sheet duplex document feeder with a dual head (single pass) scanner (available as standard on 40, 50 and 60 ppm models; not available on 25-35 ppm models) and even the tablet-feel 10.1 inch "Smart Operation" interface (as an option). Reportedly, the neat no-staple stapler finishing unit found on the C2003SP MP and MP C2503SP will be an option on the MP 2554/3054/3554 models - which can alternatively have the usual more conventional finishing units. On the faster (40 ppm up) models there will be a choice of five finishers (two different booklet makers, two conventional external finishing modules and an internal stapler). Among the new features present in these products, we also note the availability of a second network card (as an option) to connect these products to two different networks simultaneously. Clearly this will be really useful for allowing visitors to print without giving them access to the company network. We look forward to checking out that firewall! The full specs and pros and cons will be up on Your DMO just as soon as they are released to us!